My upgrade to Apple’s Aperture 3 came over the weekend so I upgraded and started letting it analyze faces using the iPhoto-inspired “Faces and Places” feature. Here’s a few observations from the upgrade process and just a little use of the Faces feature. Aperture 3’s icons are colorful, compared to its predecessor. I think they still look professional, but they are a little “friendlier” and more iPhoto-like. Backup “Vaults” seem to also require a full refresh, probably due to the library upgrade. Vault backups still run in that irritating modal dialog box that pops up and interrupts. Best to freshen Vaults when you don’t have to work on anything else, but I still love the ability to have multiple Vaults. Note, Vaults are freshened in serial - it seems to do one, then do the next. With the new Faces feature, you have to train Aperture 3 to use it. 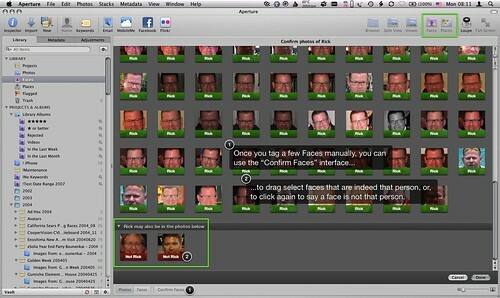 If you pick a folder of photos in your library with people you commonly photograph, and spend the time to tell Aperture who is who, you can then use the “Confirm Faces” feature to drag-select vast swaths of matching faces, or, to toggle a face to be “not Jim” or “not Jane”. It works better the more you train it, and it’s fun to see who it “thinks” you are. Family resemblances can be telling :-). Faces also links to Address Book entries. I think it’s a worthwhile upgrade just for the speed increase.